Providing a virtual waterfront location, 'The Retreat' provides quiet, comfortable, self-contained accommodation in a gloriously picturesque setting and only 3 km from the East coast township of Bicheno. Diamond Island Retreat is a family holiday home. We are delighted to be able to share it with you and your friends and family. During your stay here we hope that you are able to begin to appreciate what it is we see in this pristine environment and that you, in turn, will share that with your friends. However, if you are on a return visit we'd like to say, welcome back. You only need stand on the expansive deck and look out toward the sea to see why this place is called Diamond Island. This is a jewel in the sea. If you can tear yourself away from the view, take a short stroll (200mts) across the paddock in front of the Retreat, through the gates and past the penguin burrows, you will come to our stunning beach. We call it 'our' beach because it certainly feels private. I assure you, once you step foot on the beach and feel the sun on your skin and wind in your hair the stress and worry of your everyday life will be carried away on the gentle breeze. At low tide, you can venture across the sand bar to visit Diamond Island. Extreme care is required to avoid disturbing the delightful little Fairy Penguins as this is a protected sanctuary for the little birds. Swim the crystal clear water, surf the waves at Redbill beach, explore the rock pools, go beachcombing for seashells, or just relax on the spacious deck at 'The Retreat' with a glass of chilled Tasmanian bubbles or a frost ale. If you are lucky you may spot dolphins playfully frolicking in the shelter of Diamond Island or perhaps even whales on their migration down the East Coast. Accommodation at 'The Retreat' consists of 1 queen size bed, 1 single bed and pair of bunk beds. Linen, doonas, pillows, blankets and towels are all provided. You also have access to our laundry facilities (washing machine and dryer). With a comfortable leather lounge suite, reverse cycle airconditioner and heater, 40' flat screen LCD TV, CD, Blu-Ray DVD player with a selection of movie titles, you are assured of a stress-free & relaxed holiday in this captivating place. Free wifi is available at Passinis Cafe so if you need access, buy a coffee and chill for an hour. The 3-4G network is available at The Retreat but Telstra offers the best coverage so maybe consider a Telstra SIM card for your holidays. Once the NBN goes through we will seriously consider introducing a wifi connection from the cottage. The kitchen is equipped with all the utensils and crockery you could need, so feel free to cook up a storm either indoors on the new stove and oven or outdoors on the gas BBQ and outdoor dining table. Alternatively venture into the township for a counter meal or enjoy some of the wonderful local restaurants and cafes such as Pasini's, The Shed or bakery. All specialise in local and seasonal fare. If you don't fancy driving, one of the best restaurants on the east coast is 5 minutes walk away! The chefs at 'Facets' restaurant specialises in dishes that focus on local seafood, beef, fruits, wines and cheeses. It is Tasmania's famed cuisine at its very best. A safe 4km walking and bicycle track, built as a bi-centenial project links 'The Retreat' with Bicheno and the blowhole. Perfect for a healthy stroll or to build up an appetite. Please note that we are a privately owned cottage & not affiliated in any way with the Diamond Island Resort near by. BOOK NOW FOR A RELAXED AUTUMN GETAWAY OR A WINTER ESCAPE. SUMMER VACANCIES ARE ALMOST AT CAPACITY SO DON'T DELAY. Situated an equal distance from the capital city of Hobart in the South and the northern city of Launceston, Bicheno is a popular holiday destination for Tasmanian and interstate visitors alike. This part of Tasmania enjoys its own Mediterranean microclimate. The East coast is generally several degrees warmer than the rest of Tasmania all year round. It is out of the rain shadow of the west coast and the highlands and its nooks and crannies are where savvy Tasmanians go for rest and recreation. Originally a whaling town, Bicheno is now home to a thriving fishing industry and is a vibrant tourist destination. 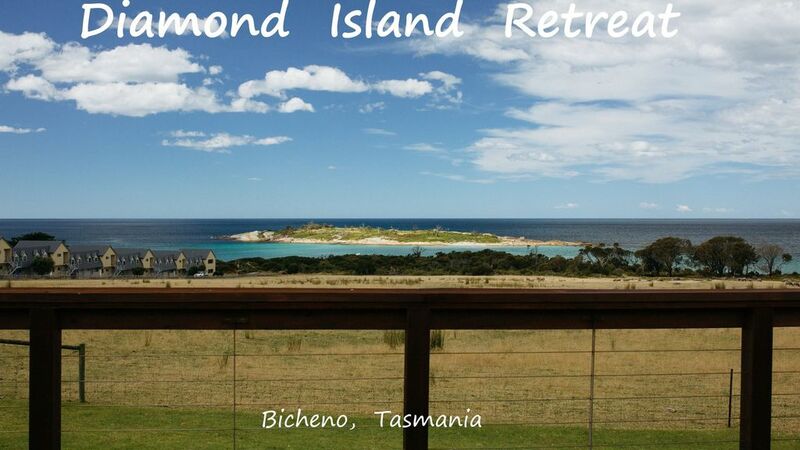 Bicheno provides a perfect base for exploring the unspoilt beauty of the East Coast of Tasmania. The Apsley Gorge National Park, breathtaking Freycinet Peninsula, quaint Coles Bay & Swansea townships are all a short drive from Bicheno. Penguin tours (bookings required) are held nightly all year round 5 minutes walk from The Retreat. Diving and fishing charters operate out of Bicheno and glass bottom boat tours highlight the magnificent kelp forests that grace the East Coast of Tasmania. Bicheno has a wide range of activities to cater for every taste and budget. $100 deposit (or total cost for single night) required within 7 days of confirmation of booking. Balance of rental required 14 days prior to the commencement of the rental period. Payment can be made by credit card through STAYZ. Deposit will be refunded if cancelled up to 30 days before rental period. Wish I'd booked for longer! We absolutely loved our stay at the Diamond Island Retreat. The view was amazing and the kids loved that there were sheep in the paddock and bunk beds! It was also quite special to hear all the noises at night - the rain on the roof, the waves crashing on the shore and the penguins!! If we're ever back in Bicheno, we know where we're staying. I will definitely recommend your place to my QLD friends heading this way later in the year. Thanks for your hospitality and homely touches. Wow, what a lovely review. Thank you. We are thrilled you and your family had such a lovely time and we see your desire to return, as well as sharing the love with other family and friends, as the ultimate compliment. We are most humbled. When you do make your return, make sure you contact us directly first and we will make sure you get a nice little discount. If you would like to leave a public comment, swing by our Facebook page and post and don't forget to post and tag your pics. Lovely accommodation for a short family stay. Great location to walk across to the island and drive to Freycinet NP. My family enjoyed their stay at Diamond Island Retreat. Bree & her family have been delightful. No hesitation in recommending then to other hosts. Bicheno is such a lovely town. Diamond island retreat has the best view to diamond island. Really enjoy the view when we have breakfast and dinner. The house is quite close to the main highway through town so you can hear some road noise at times but it was never loud enough to effect our sleep or bother us! Thank you for a great stay! This town certainly exceeded our expectations! Hi Tiffany, we are thrilled you enjoyed your stay. Clearly, you have had many 'WOW' moments and that is so heartening for us. How great is that view through the front window? We never tire of it either. Thank you so much for the wonderful feedback. Please come back and see us again soon and we'll make sure you receive our returning guest discount. This is our second stay at Diamond Island Retreat. We loved it! The cottage is well equiped and very comfortable. Accommodation, equipment and services, cleanliness and location - all perfect. Highly recommended as a place to stay in Bicheno. Lots to see and do. Just watching the sheep in the front paddock is enough to put one into holiday mode! Saw some fairy penguins - bonus.